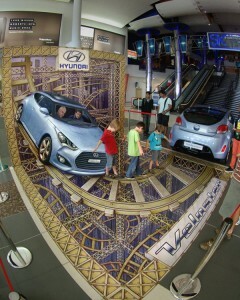 In the city of Durban, South Africa, I created the final of the three illusions for Hyundai. This image had a complicated overlay that allowed people to pose in the car. Durbin has a huge population if people from India, which gives it a particular flavor. It is usually very hot and humid, but the weather was perfect for the event. I stayed in a modern hotel that was strangely furnished. It had an open floor plan with the bathroom in the middle of the room. There was literally a self-standing bathtub smack in the center of the room. The W.C. was in a tiny booth with only a frosted glass door for privacy. I was sure glad not to be sharing a room like that! At the end of my African stay I flew back to Johannesburg and had a few days to visit a game park. Instead of the more famous (and huge) Kruger national park, my host sent me to the Ivory Tree Game Lodge in Pilansberg. This turned out to be a great choice. I saw all of the big animals (except a leopard). I could have easily stayed another week there. Hundreds of spectators got to see the world’s foremost 3D pavement artist in action in Durban today. American artist and former NASA illustrator, Kurt Wenner, gives graffiti a whole new meaning. Wenner uses remarkable techniques to produce 3D art works. “The idea is that the entire picture needs to be distorted so it’s seen properly from one point in space. So as long as you shooting it from one point in space, it looks normal, but it’s not the point that you looking at the picture when you drawing it.” Wenner worked at America’s space agency NASA, as an advanced scientific illustrator. It’s almost impossible to pass by his work without being sucked into the worlds he creates. People viewing his work have described it as innovative and something they never get to see regularly.”I think it’s amazing. I’ve never seen anything like this in public especially, but it’s amazing. I’m thankful I have the privilege to be here and experience this.” His works have been seen in 30 countries across the world. Wenner’s 2010 Greenpeace giant composition set a world record for the largest image of its kind drawn by a single person – 22 by 22 meters.